Trucking accidents are some of the worst kinds of accidents there are, as they often involve one big-rig and one small, non-commercial vehicle, which is a lot like a whale and a minnow going up against each other—the minnow does not stand a chance. 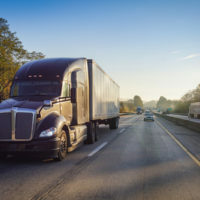 While commercial trucking companies have taken measures to prevent accidents such as restricting drivers’ hours, requiring detailed driving logs, and mandating that truckers take x amount of breaks throughout a shift, wrecks were still happening. So what did these commercial companies do? They turned to technology. Technology is a wonderful, wonderful thing, and it has saved countless lives in more ways that we can count. Its use by commercial trucking companies is just one more way that technology saves the day. Dash-cams, auto-braking, lane departure warning, and readily available driver data are just some of the technology that trucking companies are using to prevent unnecessary wrecks. While not every commercial trucking company is on board with the advanced technology (which many smaller companies cannot reasonably afford), bigger companies such as Walmart and Waste Management have put them to good use. And the bigger companies are making a huge difference, as they account for a majority of the truckers on the road. According to AllTrucking.com, there are 3.5 million truck drivers in the U.S. According to TruckersReport.com, one in six people who die on the job are truckers. And according to the New York Times, while car accident fatalities are on the decline, trucking accident fatalities are on the rise. Industry leaders are testing new technology to reduce the amount of wrecks caused by their drivers, to reduce insurance rates, and to reduce driver turnover rates. They also hope to reduce the costs associated with litigation, which can quickly spiral out of control following a bad accident or an accident in which fault is disputed. As you can see, the industry has a lot riding on reducing accident rates, and while their efforts might not be totally altruistic, they are a step in the right direction for increasing driver safety. Trucking companies hope that dash-cams will force their drivers to follow the rules of the road and trucking regulations more closely, as well as help them to identify who is truly at fault when an accident does occur. They hope that electronic log systems will enable them to more closely monitor what their drivers are up to, how many hours they’ve been driving, and how fast on any given work day. The ultimate goal is to increase regulation compliance and reduce the amount of truck accidents at the same time. Unfortunately, despite the measures that truck companies take to prevent accidents, truck accidents are still going to happen. If you or a loved one was injured or killed in a commercial truck accident, you may be able to recover compensation for your injuries and other damages. To see what legal rights you have following a serious accident, call Spencer Morgan Law at 305-423-3800 to schedule a free, confidential consultation with a knowledgeable Miami truck accident attorney today.